Summary: Researchers report tailored music sessions may be crucial in helping transform the lives with communication problems, such as those associated with autism, brain damage and stroke. 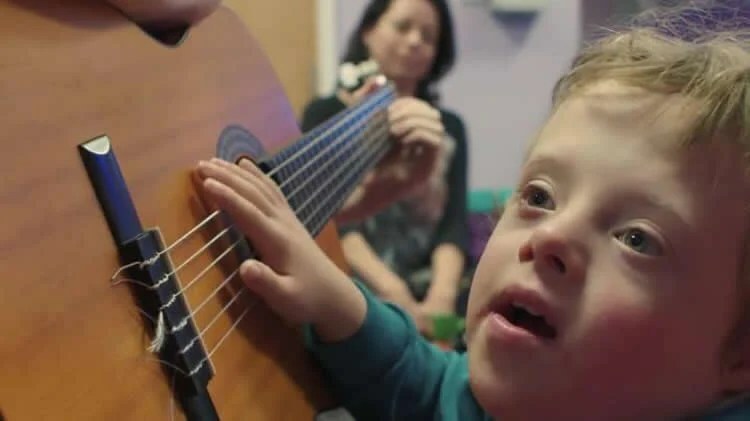 Tailored music sessions could be crucial in transforming the lives of millions of people whose speech is impacted by learning difficulties, strokes, dementia, brain damage and autism, a new study suggests. It could enable individuals and their families to feel less isolated or neglected within society, while enhancing their ability to communicate, both with each other and the wider world. But consistent funding and provision needs to be increased, while health and community providers need to implement a more integrated approach to using music in supporting those impacted by strokes and dementia. Those are among the key findings of Beyond Words, a project led by the University of Plymouth and Plymouth Music Zone (PMZ) and funded by the Arts Council England Research Grants programme. It focused on those who have problems communicating with words — who the researchers now term as being ‘post-verbal’ — and how music might be used to help them. The study is the first to focus on post-verbal people and music, and one of the first to explore how music can have a positive effect on a wide range of health-related issues and how future provision might take them all into account rather than focussing on only specific groups within society. Jocey Quinn, Professor of Education at the University, led the study which involved a series of interviews, focus groups and arts workshops, as well as observing the regular sessions offered by PMZ. Debbie Geraghty is the Executive Director of Plymouth Music Zone, the award-winning charity which was the focus of the groundbreaking longitudinal research. The charity is at the forefront of using music as a powerful tool for inclusion and social change and reaches out to vulnerable children, young people and adults across Plymouth and beyond. For the project, research assistant Claudia Blandon spent 16 months observing sessions delivered by PMZ and following the lives of 25 people who attend sessions at the centre and other community venues like care homes. MPZ’s Training and Research Manager and Music Leader, Anna Batson, was the third member of the research team who brought musical expertise to the findings. It also involved interviews with 44 family members, which offered an insight into the richness of the lives led by ‘post-verbal’ people, 30 arts workshops with the post-verbal people and four focus groups with music leaders and volunteers based around current provision and how they felt it might be enhanced. The Beyond Words report focused on those who have problems communicating with words and how music might be used to help them. NeuroscienceNews.com image is credited to Plymouth Music Zone/University of Plymouth. The final report is now being communicated to policy makers, charities and others in the hope that the type of sessions offered at Plymouth Music Zone, and other similar centres, can be increased in a sustainable manner. Some of its findings have already been communicated during conferences in Plymouth, Poland and the United States, with the hope that the lessons learned could be implemented internationally. Funding: This research was supported by Arts Council England. Image Source: NeuroscienceNews.com image is credited to Plymouth Music Zone/University of Plymouth. University of Plymouth “Music Sessions Can Help Millions Who Struggle to Speak to Lead a Richer Life.” NeuroscienceNews. NeuroscienceNews, 15 June 2017. University of Plymouth “Music Sessions Can Help Millions Who Struggle to Speak to Lead a Richer Life.” http://neurosciencenews.com/music-language-6918/ (accessed June 15, 2017).